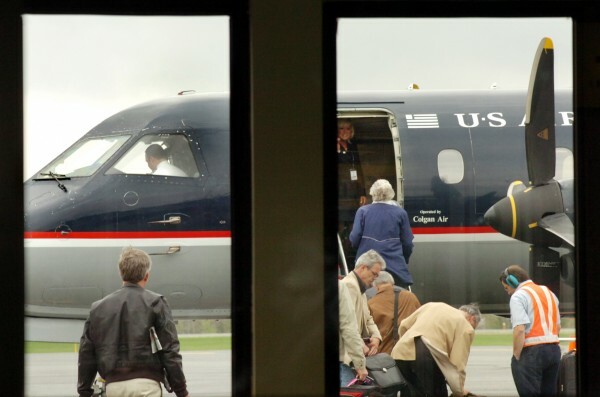 Passengers board a morning US Airways flight bound to Boston at Northern Maine Regional Airport in Presque Isle in 2008. Starting March 25, US Airways will offer daily nonstop flights between Bangor International Airport and Reagan National Airport in Washington, D.C., as well as additional nonstop flights between Bangor and Philadelphia. BANGOR, Maine — Starting March 25, US Airways will offer daily nonstop flights between Bangor International Airport and Reagan National Airport in Arlington, Va., as well as additional nonstop flights between Bangor and Philadelphia, BIA Director Rebecca Hupp announced Wednesday. US Airways now operates three daily flights from Bangor to Philadelphia and has offered only weekend service to Washington, one of its primary hubs, for the last year. With the changes taking effect in late March, there will be one additional outgoing flight and one additional incoming flight between BIA and Philadelphia each day, as well as two outgoing flights and two incoming flights daily between Bangor and Washington D.C.
Hupp said the expansion was made possible by recent Federal Aviation Administration approval of a slot transaction agreement between US Airways and Delta Air Lines. That means US Airways will cease its LaGuardia air service from Bangor on March 25. The additional daily service — designated Flight 3888 — between BIA and Philadelphia will use 50-seat CRJ-200 regional jet aircraft operated by US Airways Express partner Air Wisconsin. A flight will depart Philadelphia at 3:45 p.m. and arrive in Bangor at 5:21 p.m. A flight will depart Bangor at 6:11 p.m. and arrive in Philadelphia at 7:55 p.m.
• Flight 3887 from Bangor to Washington departs at 8:59 a.m. and arrives at 11 a.m.
• Flight 3884 from Washington to Bangor departs at 10:05 a.m. and arrives at 11:54 a.m.
• Flight 3779 from Bangor to Washington departs at 12:20 p.m. and arrives at 2:18 p.m.
• Flight 3806 from Washington to Bangor departs at 10 p.m. and arrives at 11:45 p.m. US Airways operates more than 3,000 flights per day worldwide and services more than 200 communities. Ticket prices for the new flights were not immediately available. Correction: This story has been updated to clarify that Reagan National Airport is located in Arlington, Va.